Subterranean Dungeons under Ma Boyle's? Thread: Subterranean Dungeons under Ma Boyle's? I was in (I think it's) Ma Boyles Inn by the Sailors Church. The pub's then landlord told me that underneath were the dungeons which at one time housed French POWs from the Napoleonic era. He said everything was just as it was when it was closed. The shelves upon which they slept, their grafitti on the walls, eating utensils, tables; the lot. He added that there were tunnels underneath through which one could walk at least to the Pig and Whistle pub. It seemed to add up because I think it was there, that beautiful white building facing the Strand, where Liverpool's original castle or fort stood. I asked why it wasn't 'opened' as a tourist attraction. It was a money spinner. He said because of its connotations to the slave trade it would be politically incorrect. Just repeating what he told me. Don't shoot the messenger. I used to drink in this pub every Friday night for years and never heard this story at all, even when I told the landlord of my interest in the Williamson Tunnels. I'm not knocking your story in the slightest though But as the crow flies from Ma Boyles to the Pig, it would have to pass by very close to the foundations of St Nicks - which was heavily bombed as you know. It's news to me as well. However, I can understand how the rumour might have been started. 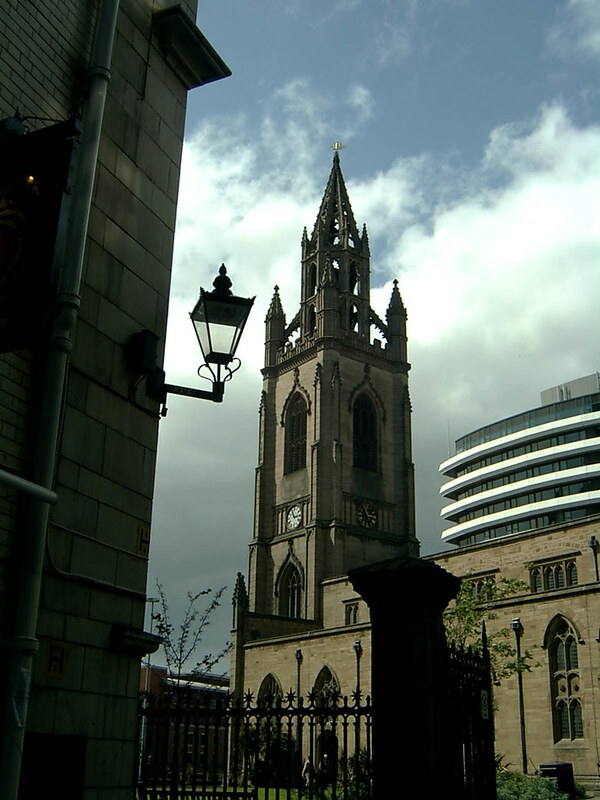 The Tower Buildings are on the site of the Liverpool Tower which was built in the 13th century. It later became a gaol. However, two large buildings have since been built on the site, so the foundations and cellars of those would almost certainly have wiped out any dungeons (if they ever existed). Below are some facts and dates taken from the "Annals of Liverpool". It is probable that Sir John Stanley either enlarged or entirely rebuilt the Tower in 1406. The Tower leased by the Corporation from Thomas Clayton in 1737, who had purchased it from the Earl of Derby. Used as the town gaol until 1819, when it was demolished. The Tower (aka the Gaol) and the adjoining house, bought by the Corporation for £1,535 from Sir Richard Clayton. 10 Nov 1775. The materials of the Tower, with those of an adjoining house were sold for £200 on 8 December 1819. Tower pulled down in March 1820. Tower Buildings, Old Church Yard. First stone laid 4 December 1846. Architect: J A Picton. Tower Buildings, Old Church Yard. Demolished May 1907. Tower Buildings, Pier Head. Completed 1908. Architect: W Aubrey Thomas. May have been a little romantic embroidery by the landlord but he did say he had been down there and spoke in first hand terms. Just strolled into town via Mount Pleasant earlier. One of the buildings (though they all seem to be of similar period) has the date 1822 on it. Wow! That is old. Got me wondering how many other buildings in and around the city centre are as old or older. I seem to recall the oldest being the restaurant on the right walking up out of town. Apparently those high, narrow Hanseatic buildings (Central Pub) opposite Central Station were built by German seafarers so were built in the northern German style. It was a beautiful wood-panelled room not much bigger than a ship's cabin and very much in that style. Around the walls pictures of the aristocracy of Scandinavia, many of whom had personally visited. I think he said it doubled as a consulate. Kings, queens, the great and the good. The room was there for the exclusive use of ships captains to do their shore work in peace; relax, entertain; get away from the madding crowd. Fascinating. Nothing has been changed at all. Well I've got my Underground Liverpool business cards printed up so I'll take one along and see what I can find out. Interesting as the basement of Ma Boyles is under the street and indeed under the church yard of St Nicks. Ma Boyles's is part of Tower Buildings. You're spot on Philip. After all the times I've passed down Tower Gardens, I've never once associated Ma Boyles actually being part of Tower Buildings. The facade of Tower Buildings is certainly grander than the rear that's for sure!! Having been in shipping since 1980, my round used to take me to places like Albion House where Lamport & Holt were then situated, Harrison line in Mersey Chambers, Covent Gardens and indeed Bahr Behrend. Some of these places looked like time stood still. They still printed and copied everything on print banding machines, the telex machines had hole punch ribbon for reading the messages and the wood panelled cashiers rooms where you got your bills of lading stamped shipped on board were olde worlde, this was when the customs house was the whole ground floor of Cunard buildings and there were certain nice smells in the buidlings. No doubt there's a few on here that can go back a lot further than that. Although I have no interesting stories to add here, I may aswell post a link to my Cunard Building basement report from last year. Even though Cunard no longer own it, the basement is full of original features and paperwork. The space has not been needed, and so these rooms have not been cleared out. Most of the store cupboards elsewhere in the basement are rented by businesses with offices in the building. Yes I agree that French prisoners of war were housed in the Tower which stood on the spot where Tower Buildings now stands and thus where Ma Boyles Inn is located. The fact that French prisoners and some Americans too were incarcerated in the Tower is recorded in Richard Brooke, F.S.A., Liverpool as it was in the Last Quarter of the Eighteenth Century 1775-1800. J. Mawdsley and Son, Liverpool, 1853. As Philip says, it seems unlikely the dungeons from the Tower still remain but it would be interesting to know for sure. I welcome your further enquiry, Michael, Cadfael, or someone. Thanks in advance. I don't believe I have ever been in the inn but I went up that back street when I was home in May and took the following photograph standing next to the pub. or till buried at the public charge. this dead-house has always more or less occupants. upon the faces of the drowned within. of birth tattooed upon his arm. he seemed his own headstone. The church was my local haunt on a Friday night to annoy the locals from the church tower and we all used to pile in to Ma Boyles afterwards. You get a cracking view from the top of the tower!! My only claim to fame in respect of St Nicholas Church is seeing in 2000 there. It was a bitterly cold night; it would have ripped a greatcoat to shreds. My poor girlfriend at the time was dressed (undressed) for an iconic New Year's Eve. How she didn't perish is beyond medical explanation. I was in a thin suit, no overcoat. We went inside and the peace, the tranquility, the warmth and the friendliness shown to us was heaven sent. There was a community in there and like kids we sat and listened to the service in the soft lights. We felt as though we were in God's presence. Perhaps we were. It is perhaps the only New Year I can remember, with fondness. Thank you, St Nicks. The one thing I didn't know when visiting the church for a meeting a couple of weeks ago is that St Nick's has an underground series of rooms for toilet facilities and the like. There was no one to ask whether this was created since the church was virtually flattened or there had always been an underground section to the church. I'll have to contact a few bods and try and find out. Waste from the church will drain into the main interceptor sewer under the dock road. However, even if you could find out when the connecting pipes were added from the church, it wouldn't tell you much about the history of the rooms down there. Sewerage in that area is now owned/maintained by United Utilities, so if you want to investigate further that might be a possible line of enquiry. One of the biggest things I hate in general - through no fault of it's own, is that Liverpool has lots of underground places but it is the people that know about them yet aren't really bothered about them. What I mean is that we all have our interests in life, what I like, the next person on the street won't. You are sure to bet that there are people all over liverpool who know about underground places that most people don't and have never brought it up because they've never thought there would be an interest - 'who would be interested in a smelly old tunnel'? I remember take some people around on a tour of the Williamson's Tunnels a couple of years ago and there was one old spritely lass who had more energy than me despite being about 80. She turned around and said - like she was discussing the soaps - 'Oh the whole of Liverpool is full of tunnels, my mother used to get from one side of London Road right up to by the Adelphi by a trap door in someone's basement - it cut out a long walk when it was raining'!! And you stand there thinking that you've just heard the meaning of life!